This new generation full automatic Direct Drive Overlock Sewing Machine with Automatic Trimmer and Suction Device is a combination of precision machinery and electronic technology. It is widely used for the joint seaming and decoration seaming on various materials, such as general garments, underwear, bedclothes, thin package and leather products, there are many different stitches for your selection. The thread tension is easy to adjust to achieve better sewing quality. The highest speed is up to 8000rpm, it greatly enhances the production efficiency. The needle bar inbuilt is to prevent oil leakage, meanwhile, the components are specially designed for anti-friction, more wearable and enduring, save the maintenance, save your cost. Equipped with the brand-new automatic infrared sensor device, no need to step on the pedal, will save the effort, and make the operation more easier. Looking for ideal Full Automatic Direct Drive overlock sewing machine Manufacturer & supplier ? We have a wide selection at great prices to help you get creative. 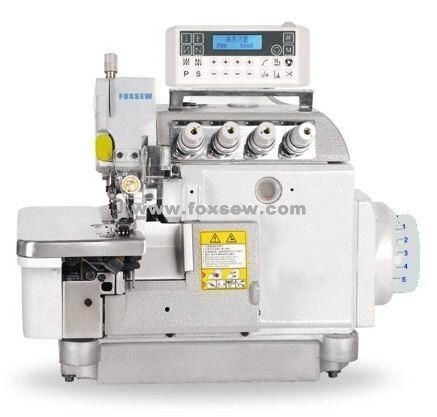 All the Automatic Direct Drive Overlock Sewing Machine are quality guaranteed. We are China Origin Factory of Direct Drive Overlock Sewing Machine. If you have any question, please feel free to contact us.